Georg Fischer or GF is a Swiss company which started in 1802. 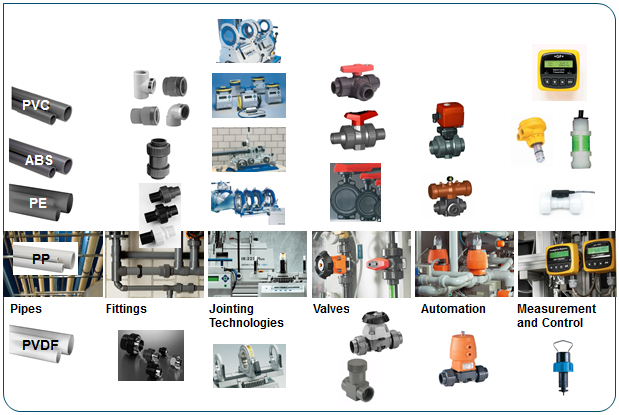 It has over 100 years of experience in piping technology with manufacturing facilities spread across Europe, USA and Asia producing a range of products for different applications i.e. water, gas, power plants, mining, manufacturing, etc. For gas distribution, GF Polyethylene Pipe is used widely for underground systems that offers many advantages over steel pipes i.e. no corrosion, light weight, easy and faster to fused, live tapping, longer life span amongst others. In piping construction, PE is mostly used for buried gas and water lines. For this range of applications, polyethylene has become the dominant material in numerous countries. But also building technology and industrial piping installations make use of the advantages of this material. Other plastic pipe and pipe fittings. The inner layer of the pipes is made of cross-linked polyethylene (PEX-C), which provides the product with a good mechanical solidity and a particular outstanding thermal resistance. The inner intermediate PEX-C layer is provided with a tape so to be integrally attached to the intermediate aluminium alloy layer. The aluminium film is adapted to the PEX-C pipe and welded longitudinally. Aluminium alloy films with different thicknesses are used to deve- lop the various diameters: 0,40mm for diameters 32 pipes; 0,20mm for diameters 16-20-25 pipes. The intermediate layer is an oxygen barrier and provides the EASY•GAS and EASY•WATER systems, the typical stability for metal piping. The intermediate layer is also provided with tape so as to attach it to the outher layer in polyethylene (PE), the purpose of which, is to protect the aluminium against any actions of external agents (oxygen, humidity, etc…).